The first day of the Republican National Convention, which boasted the theme of "Make America Safe Again" touched on the Benghazi controversy that many Republicans equate with Hillary Clinton. 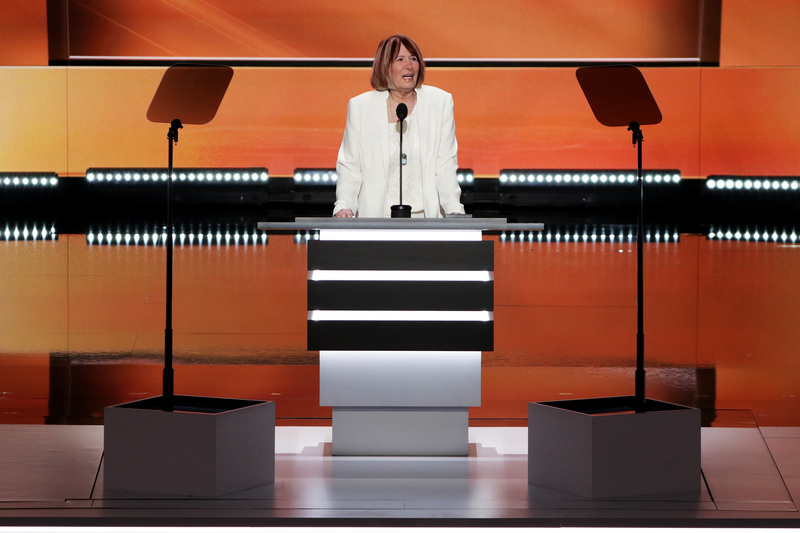 Patricia Smith, the mother of Sean Smith, who was killed in Benghazi, gave a speech about her son's death and how she blames Clinton for it. It was followed by a pre-filmed video about Benghazi. Twitter reacted to the speech in very different ways. Some called it an emotional and powerful speech by a grieving mother and proof that Clinton should be penalized for the event, while others called it disheartening that the RNC would bring a traumatized mother on stage to further propaganda. Josh Rogin, a columnist for The Washington Post, wrote, "I feel for Pat Smith, but the RNC and Trump are using her and her son's death for politics and that's wrong." You can read the speech below. My name is Patricia Smith. My son Sean was one of four brave Americans killed during the 2012 terrorist attack at Benghazi. Sean was a wonderful son and father to my two amazing grandchildren, Samantha and Nathan, now 10 and 11. He was proud to serve his country with the United States foreign service. The last time I talked to Sean, the night before the terrorist attack, he told me, "Mom, I am going to die." All security had been pulled from the embassy, he explained. And when he asked why, he never received a response. Nobody listened. Nobody seemed to care. The very next day, he was murdered by radical Islamic terrorists. To this day, I don't even know why a computer guy like Sean was sent to Benghazi. That night, we lost sons, brothers, fathers and husbands. We lost four brave Americans, who made the ultimate sacrifice for the country they chose to serve. And the American people lost the truth. For all of this loss, for all of this grief, for all of the citizens and the tragedy of Benghazi has brought upon America, I blame Hillary Clinton! I blame Hillary Clinton personally for the death of my son. Personally! In an email to her daughter shortly after the attack, Hillary Clinton blamed it on terrorism. But when I saw Hillary Clinton at Sean's coffin ceremony two days later, she looked me squarely in the eye and told me a video was responsible. Since then, I have repeatedly asked Hillary Clinton to explain to me the real reason why my son is dead. I'm still waiting. Whenever I call the state department, no one would speak to me, because they say I am not a member of the immediate family. Hillary Clinton is a woman, a mother and a grandmother of two. I am a woman, a mother and a grandmother of two. How could she do this to me? How could she do this to any American family? Donald Trump is everything Hillary Clinton is not. He is blunt, direct and strong. He speaks his mind and his heart. And when it comes to the threat posed by radical Islamic terrorism, he will not hesitate to kill the terrorists who threaten American lives. He will make America stronger, not weaker. This entire campaign comes down to a single question: If Hillary Clinton can't give us the truth, why should we give her the presidency? In response to applause and commentary from the audience, Smith replied, "That's right: Hillary for prison. She deserves to be in stripes."